Before I talk about the election results I would first like to say that many people will have noticed a distinct lack of blog posts reecently. I offer my sincere apologies and an explanation in that, as many people know, I am now working full time (which I wasn't a year ago) and additionally being a small part of Paul Scully's election team, almost all my other spare time has been taken up in the fight for a Conservative win in Sutton, Cheam and Worcester Park. So while I have had numerous local stories ready to write (and loads of pictures ready to accompany them), I simply haven't had the time to turn them all into blog posts. I would like to add how much of a privilege it has been being part of such a great team in Worcester Park helping to get the message out about Paul Scully. Whether people have been giving every hour God sends or just a couple of hours over the course of the campaign, these people have made a huge contribution and I thank them all. I guess most Worcester Parkers, wherever in KT4 they reside, now know they have a Conservative MP. 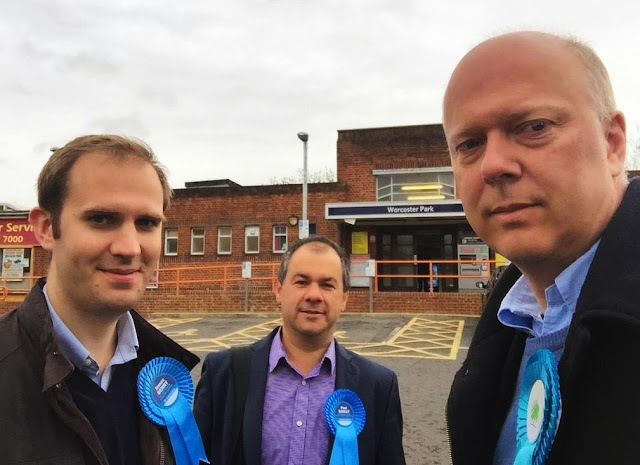 For a long time only the small Epsom and Ewell sector of WP had one in the form of Chris Grayling while the rest, being the Kingston (Old Malden) bit and the larger Sutton and Cheam bit were represented by (I was going to write had foisted on them but thought better of it...) Lib Dems. As of Thursday night/ Friday morning this all changed as all three constituencies elected Conservative representatives. James Berry overturned a huge majority of 7,560 to beat Ed Davey in Kingston and added a comfortable majoity of 2,834 on top of that. Meanwhile Paul Scully in Sutton, Cheam and Worcester Park managed to finally defeat Paul Burstow, turning a Lib Dem majority of 1608 into a very respectable Consertvative majority of 3,921. As I mentioned before it has been a great honour to be part of the team that has helped achieve this, and once again I would like to thank all those who specifically helped the cause in Worcester Park. Here is the video I took of the actual Sutton Cheam and Worcester Park declaration, made by Sutton's Mayor (and Worcester Park resident and councillor Arthur Hookway). Politics is the most astonishingly brutal business. Over the course of Thursday night/Friday morning many people lost their political careers while many others began theirs. As many of my friends here know, I have been working very hard with Paul Scully's team in Sutton, Cheam and Worcester Park for the last few years to help get him elected to parliament. On Thursday night I watched that dream come to fruition. Being one of Paul's counting agents I saw this unfold in detail at the Westcroft leisure centre in Carshalton where the votes for both Carshalton & Wallington and Sutton, Cheam & Worcester Park constituencies were counted. It also meant that I didn't see the overall national picture unfolding apart from a few comments from people who had heard various bits and pieces filtering through. Watching the votes being counted we could see early on that Paul had done well. In some cases Paul looked to be two or even three to one ahead of his Lib Dem rival (Paul Burstow). What was even more exciting is that Matthew Maxwell Scott, our candidate in Carshalton & Wallington, which wasn't a target seat seemed to be keeping up with his Lib Dem rival Tom Brake. The penny started to drop about the enormity of the national Conservative win when the news filtered through that Lib Dem Ed Davey had lost his seat in Kingston to our man James Berry, overturning a majority of nearly 8,000 and turning it into a Conservative majority of nearly 3,000. It was amasing news but to look at it from a different perspective for a moment or two, for every winner there are several losers. I know from my own bitter experience how it feels to lose an election, having stood for a council seat twice in Worcester Park and lost both times to the Lib Dems. So when I saw Paul Burstow walk in with his wife at around 3am, long after we could all see the outcome piling up on the tables, I had a fair idea of how he must be feeling. Having been Sutton and Cheam's MP since 1997, I knew the depth of his disappointment would be immeasurable compared to my not gaining a council seat - losing a parliamentary seat has been described by some as like being 'cut off at the knees'. As much as I wanted Paul Scully to beat him, I was touched as he hugged his close friends over on the other side of the room. 'All political careers end in failure'. He knew, like all politicians know, that this day would one day come. And to his credit he kept himself professional and composed. Paul Scully arrived about half an hour later and the TV cameras on the counting floor were already pointed up in his direction. Numbers were starting to come through from the Carshalton & Wallington side of the room and unfortunately Matthew seemed not have managed to overturn the Lib Dem majority even though he had greatly reduced it. This was against a background of having had very little money or resources for the campaign. If someone had said a few weeks prior to this that Matthew would have achieved such a result it would have brought great happiness. Against the backdrop of Lib Dems losing to Conservative all over the country, I think it must have almost felt like letting the team down. In reality it was however an astonishing achievement by Matthew Maxwell Scott and Elliot who ran the campaign. They should be proud of having cut the Lib Dem majority there by nearly three quarters. The result from Carshalton and Wallington was announced first. Tom Brake had officially beaten Matthew Maxwell Scott by 1510 votes. Then came the Sutton and Cheam announcement - as shown above. Across the country there was no denying it was better than anything we could have hoped for. We were all exhausted but elated but it was a bitter sweet victory, given Matthew's failure to gain Carshalton and Wallington. Those on the team who hadn't been at the count were instead gathered around a television in a home in Belmont which is where we headed for at around 5am. The party was indeed still in full swing and fired up even more once Paul arrived. Champaign was served to all immediately! Over the next few hours we watched in excited disbelief as more and more seats were gained. We were like exited 10 year olds finding out we're about to go to Disneyland. At one stage I became quite overwhelmed as I remembered that the constituency also included the house in Banstead where my mother grew up. It was the house of my now deceased grandparents, both staunch Conservatives - my favourite house in the whole world. I became quite overcome as I told Paul how proud they would have been of this achievement. While enjoying all the national successes, there was another result that brought home the brutality of this business and which was one I would ordinarily be celebrating. However it's direct effect on a dear friend of mine; also the Godmother of my son made it difficult to take pleasure from. The Labour MP Alison Seabeck lost her seat to Conservative Johnny Mercer. My friend was Alison's constituency office manager and is therefore now officially out of a job. For every lost seat there are several lost jobs just like this, just as a similar number of jobs are created for the new MPs. The net total is about the same however that doesn't make it easier for those who no longer have an MP they can work for. In Sutton and Cheam there will be several people I know and know of, some of them local Lib Dem councillors who will have lost their day jobs along with Mr Burstow. So while I am elated about the local result and the overall result for the country, I understand the personal pain many individuals are feeling at the change in their own circumstances. And on a personal level I offer my sympathy to those who have lost out. Politics is a brutal business. It is not for everyone. Those who enter politics do so in the knowledge that the end could come abruptly at any election. It doesn't make it easier when the time comes, however just as a soldier signs up knowing they may be called upon to make the ultimate sacrifice, it is just part of politics that someone's career can end just like that, something which every one of us who gets involved has to face at one time or another. At the end of the day however, we have gained a Conservative majority in parliament and for me that represents the best possible outcome. I will remember this victory with great pride and happiness for a very long time to come. I'm not normally a betting man. 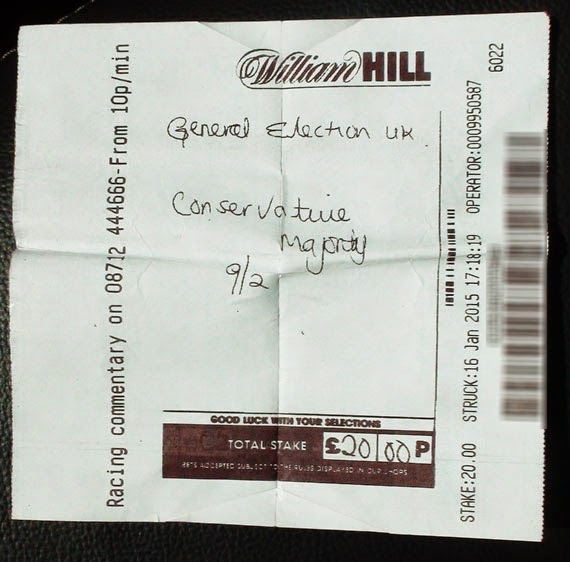 However on a cold Friday back in January I decided to put a £20 wager on the Conservatives winning a majority in the election. At 9/2 that would mean a £90 payout and always in the back of my mind was that when it came to the crunch, people would prefer Cameron's Conservatives to Milliband's Labour alternative. It was a couple of hours after such an outcome was clear that I suddenly realised I was £110 richer! What was particularly nice was that last weekend I was then able to shout the family to a rather posher than usual lunch - really just to say thanks for putting up with, and to make up for all the time I had spent out campaigning for Paul to win. It was a lovely piece of icing on a very splendid cake!